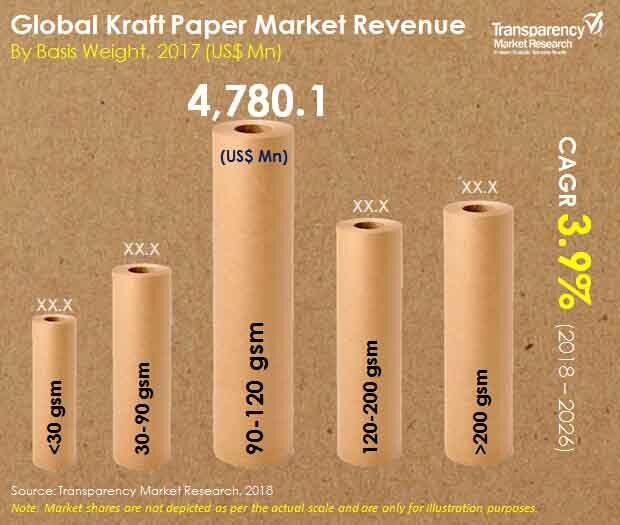 Numerous players are also investing in research and development activities to gain a competitive edge over their rivals in the kraft paper market. Analysts also see some well-entrenched players focusing on sustainable packaging solutions made from kraft paper. Names of such companies include Mondi Group, Georgia Pacific LLC, Billerudkorsnas AB, International Paper, Stora Enso, Kapstone Paper & Packaging, and Smurfit Kappa Group Plc. The global kraft paper market stood at approximately US$14.819 bn in 2017. The global kraft paper market is projected to rise at a CAGR of 3.9% during 2018–2026. Among the broad grade types, bleached kraft paper will clock a CAGR of 4.2% from 2018 to 2026, and will serve a substantial share of consumer demand. On the other hand, unbleached kraft paper is projected to contribute promising revenues to the global kraft paper market till 2026. The type is extensively used in industrial applications that need the packaging of bulky and heavy goods. Regionally, Asia Pacific is expected to rise at an attractive growth rate in the global kraft paper market during 2018–2026. The growth is riding high on the back of rapid growth in several end-use industries, notably burgeoning use of packaging made from kraft paper in food and beverages applications. Expansion in the global kraft paper market rides on the back of constant developments in the packaging industry. Emerging variety of applications are served by the packaging products made from paper board and sack paper. Manufacturers in the global kraft paper market develop products that can meet the varying needs of flexibility, strength, and barrier protection. The kraft process of producing paper packaging has generated volley of interests from consumer goods companies, world over. This is propelling the growth of the kraft paper market. End-use industries have found a promising option in kraft paper to meet the criterion of an environmental-friendly packaging. This is attributed in great part to the recyclability and reusability of kraft paper owing to the fact that the pulping process allows easy waste recovery. Thus, there is an extensive demand for sack kraft paper in wrapping, and as pouches, sacks, and open mouth valves. The rising demand for cost-effective and highly functional packaging for industrial applications is bolstering the growth of the global kraft paper market. They are thus extensively used in heavy duty bags and sacks, especially for storing powdered chemicals. The global kraft paper market received a considerable impetus from the rising demand for specialty packaging made from corrugated paper. The focus of manufacturers on developing customer-friendly solutions also reinforces the trend of customization in the global kraft paper market. In recent years, the demand for kraft paper-based packaging has picked up marked momentum from the stringent regulations on the usage of plastics in packaging. In several developing and developing countries across the globe, polymer-based packaging have attracted criticism. Fluctuating availability of raw materials for kraft pulping process in some regions may pose as significant bottlenecks in the global kraft paper market. On the other hand, the continual pursuit of innovations by manufacturers of kraft paper has led them to focus on improving the appearance and the printability of kraft paper, among various key functional attributes. To this end, they are focusing on improving the mechanical and chemical purity of kraft paper. Such developments will open new avenues in the global kraft paper market.